"Show the world your dog!" 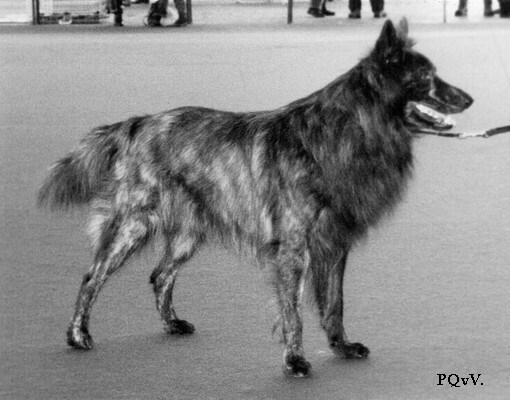 Ever since 1857, when the world's first dog show was held in Belgium, dog lovers have been presenting their dogs in the show ring. While we can all agree that good handling is important, what exactly is good presentation? Here are a few thoughts with illustrating pictures. Let's start with a photo from the 1950s. Such a proud and happy handler! I just had to include this picture, even though it's not taken at a dog show. 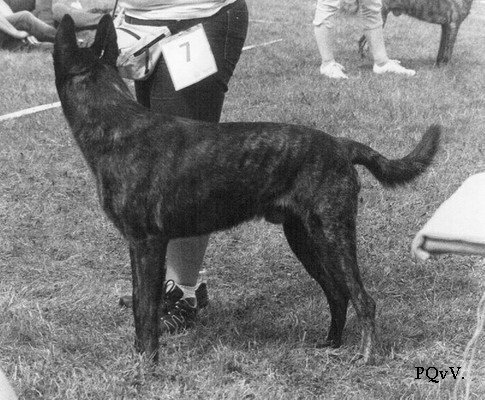 Note the dog is standing in front of the handler and looking outward, so as to be well visible. Handler at a show in serious concentration. Note that he is not trying to make the dog look at him - he's just checking that the dog stands well so we all can enjoy the sight of a pretty dog standing alert. That's what the show ring is for! 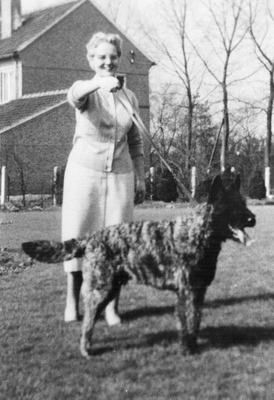 Nowadays (it 's 2018 as I write this) we may sometimes see handlers who are more intent on keeping up a good contact between the dog and themselves. They may do so by using (a lot of) food. A dog with no head. Both the judge and the public outside the ring should be able to get a good view of your dog. The judge, of course, because otherwise there'll be no report or qualification. And don't forget the public! 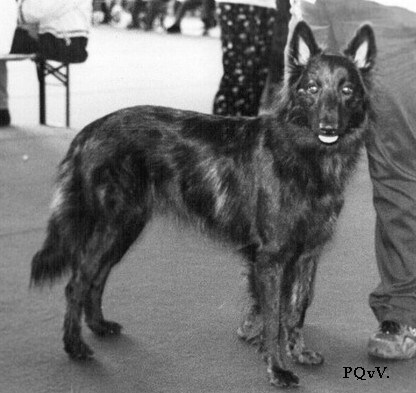 Those folks have often traveled a good distance, and paid entrance money for the show, to see and admire your handsome dog. They should be offered more than just a view of its backside. Of course your dog can have a little tidbit as a reward. But some of today's handlers enter the ring with a bag full of food and feed their dog handfuls of it. Please do realize that show time is not meal time and the ring is not a picknick place. Imagine you'd go to a singer's concert, the artist would come on stage, and then sit with his back to the audience and eat a sandwich! He would probably be booed, and rightly so. The same goes for a dog in the show ring. The ring is the place where your dog can stand out and shine! Make the most of that opportunity. There's plenty of time afterwards to have lunch. Here's a photo to which your first response might be "Look at those baggy clothes - couldn't they wear something finer?" Then, look again. Note all the dogs are standing in an 'outward' position so both judge and public can have a good view. Minor criticisms: the dog on the left might come one step forward, and the handler on the right should take a step back so his shadow doesn't fall on the dog. On the whole, this is more attractive to the public, and more instructive for students of the breed, than dogs standing turned away and/or eating. Neat clothes are nice but presenting the dog comes first. 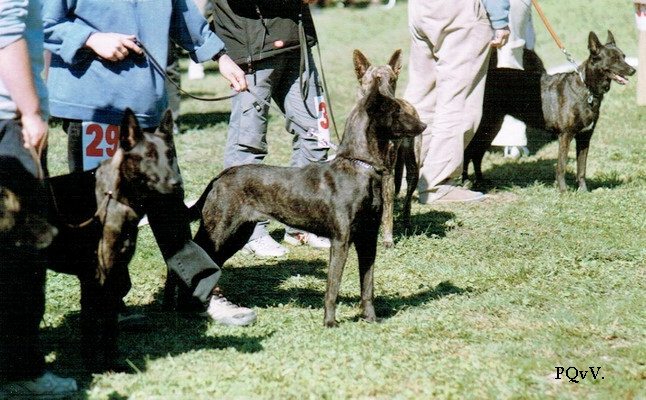 Two examples of nicely presented dogs. Note the position of the dog on the right. 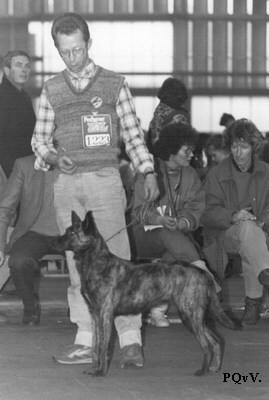 He's standing with his front towards the handler, but not too close up to him. And he's keeping some eye contact, but not looking straight up. A common mistake handlers make is keeping the dog close to them and letting it look straight up. This renders the silhouette less typical, and aggravates faults like a steep front and/or weak topline.